We manufacture a wide range of Leather Horse Pads that have been specially designed to keep the rider and the horse comfortable. Available in various colors and sizes, these can be customized as per the specifications of our clients. 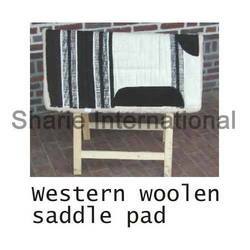 Saddle pad is made of cotton cloth. 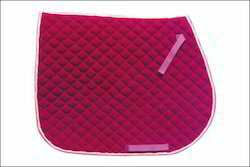 THIS SADDLE PAD IS MADE OF POLYESTER MATERIAL AND QUILTED WITH THIK CUSHION. - Desc: Made by100% Cotton Fabric, 14 mm high density foam inside, Machine Quilting, lower Cotton lining Matching PP Binding all over.